Walking under a dead Indian? On New Year's Eve, my wife and I drove from the mountain village of Volcan to the nearby Baru National Park. The Baru Park at 35,000 acres is just a small part of the much larger La Amistad International Park. This park straddles the Costa Rican and Panamanian border and takes up 511,000 acres. 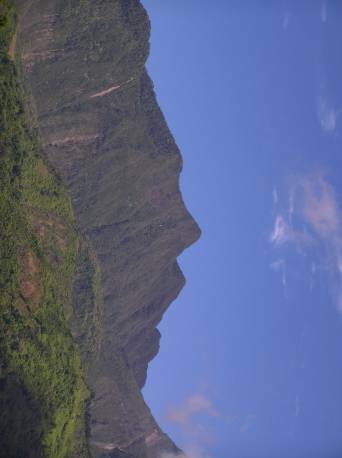 Its backbone is the mighty Cordillera Tallamanca. Part of this mountain range is the majestic, 11,000 foot high Baru Volcano – the highest peak in Panama. If you look at the Baru Volcano from the west, in the village of Volcan, you can make out a strange shape on the skyline. Locals will tell you it is the calcified body of a giant dead Indian chief. Sure enough, there is a well-defined brow, a regal nose and a gaping mortified mouth. 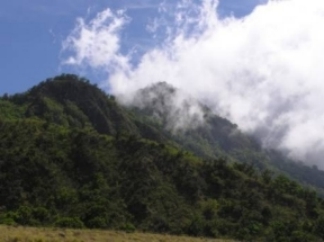 The chief’s well-developed chest extends south along the ridgeline of the Baru Volcano. To reach the Baru park, you leave Volcan, head east along the Cerro Punta road and, five minutes later, turn right at a large Coca Cola sign. The paved road winds slowly into a wide valley with sharply rising sides. At the entrance, local farmers have miraculously carved out a living by growing vegetables on the near-vertical sides of the valley. And then, suddenly, all signs of habitation cease and you are in a true mountain wilderness. This is where Panama’s wonderful diversity really comes into play. The valley floor is covered with tall dried grasses that wave wildly in the cool mountain breeze. Interspersed in the grass are large black volcanic boulders. This could be the highlands of Scotland or the southern end of the big island of Hawaii – but, no, this is the so-called hot, humid tropical land of Panama. Surreal is a good description of the surroundings. We stop our car, and step outside as a bank of clouds heads up the valley slowly obscuring our view of the Baru summit. The dead Indian chief cannot be seen from this angle – he is way above us – truly we are walking under his huge dead body. High above and unseen by us, the rare Quetzal floats on the afternoon thermals. Nearby Toucans sit passively in a tree, proudly displaying their glorious plumage for the entire animal world to see. Even at this altitude of over a mile above sea level the sun feels hot on exposed skin, this is tempered however by the cool and refreshing breeze that flows down the valley. A warning to hikers, don’t let the blissful climate fool you – you can get sunburned here very quickly. The sky high above is a deep, deep blue, contrasting with the stark white of the billowing cumulous clouds that seem to slowly boil as they ascend the summit of this majestic mountain. This is truly an awe-inspiring place. Its solitude and stark beauty can’t help but start a fire somewhere deep inside the soul. From a spot high on the valley road, you can just discern the distant coastline of the Pacific Ocean. Then the clouds swirl up the valley and the dead Indian chief is covered again in his thin and wispy shroud. Time to drive back home, back to the real world. The Baru National Park is situated just 5 minutes east of the town of Volcan, in the Chiriqui province of Panama.